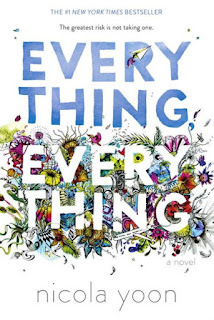 Nicola Yoon’s Everything, Everything focuses on eighteen-year-old Madeline Whittier. She has severe combined immunodeficiency (SCIDS, for short. She describes herself as being on SCID row), meaning she is allergic to the outside world. The house she shares with her mother and her nurse is her entire world, and an illustration that depicts her as an astronaut floating above the earth (81) is one of the most affecting in the novel. Everything, Everything is illustrated by Yoon's husband, David Yoon, who creates hand drawn illustrations of various size throughout the novel. The novel also includes graphs that chart her hourly breaths per minute, IM transcripts, website screenshots, and ticket stubs. When new neighbours move in next door to Madeline's house, she begins to want more than her small world provides her with. This is specifically influenced by her neighbour Olly, a teenage boy her age who teaches her that life is more than what she can read about in books. Madeline reads often and reads widely. Because she is homeschooled, her reading list is mostly self-selected. Yet, she still chooses to read the types of books that we would define as canonical, including titles such as William Golding’s The Lord of the Flies, Lewis Carroll’s Alice’s Adventures in Wonderland, Daniel Keyes’s Flowers for Algernon, Ralph Ellison’s Invisible Man, Albert Camus’s The Stranger, Samuel Beckett’s Waiting for Godot, and Nausea by Jean-Paul Sartre. She writes short, one-sentence reviews of these books under the caption “Life is Short: Spoiler Reviews by Madeline,” which reviews Invisible Man as “Spoiler Alert: You don’t exist if no one can see you” (246). Like in Stephen Chbosky's The Perks of Being a Wallflower and Jon van de Ruit's Spud, the books she reads (and her interpretations of them) mirror events in her life, and provide her with a literary lens through which to interpret her experiences. The text itself also engages with a different kind of focus on graphics and images, one less explicit that that provided by David Yoon's illustrations. This occurs specifically when Madeline describes the silence between her and Olly in the following way: “We are awkward together for a few moments unsure what to say. The silence would be much less noticeable over IM. We could chalk it up to any number of distractions. But right now, in real life, it feels like we both have blank thought balloons over our heads” (73). 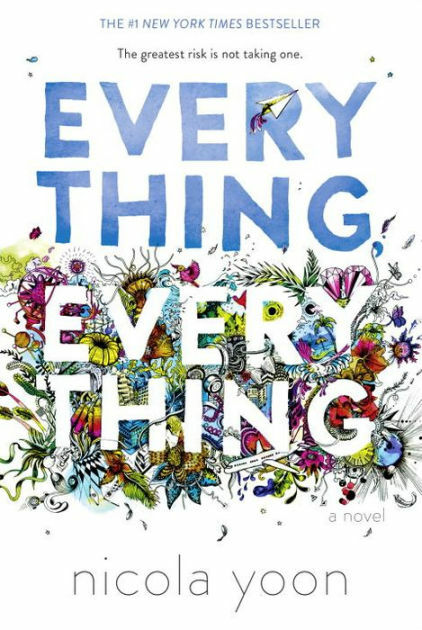 Everything, Everything follows Madeline's self-discovery, and especially her journey to live her life to its fullest . 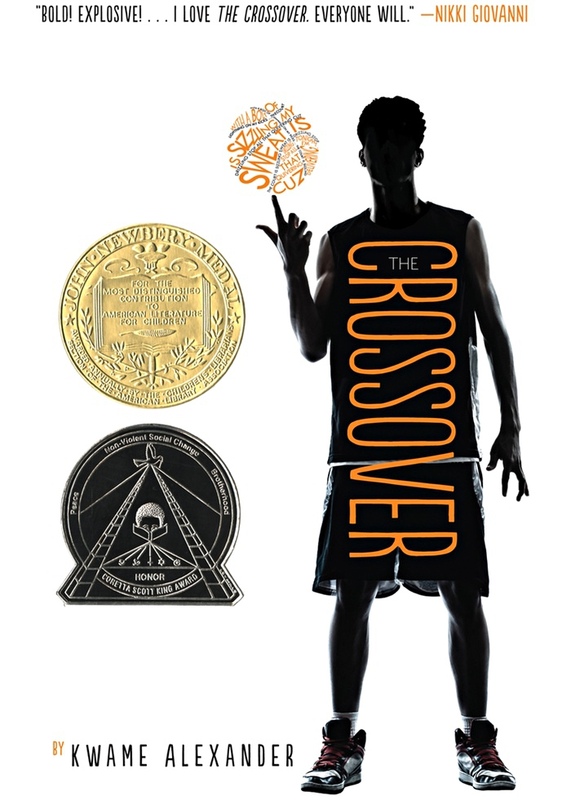 The Crossover (2014) by Kwame Alexander is a Newbery-Award winning novel told in verse that experiments with typography and visual poetry. 12-year-old Josh Bell is a junior high basketball superstar, and he plays alongside his twin brother Jordan on the school team. Like Sharon Creech's Love that Dog, Karen Hesse's Out of the Dust, or Jacqueline Woodson's Brown Girl Dreaming, the novel is communicated in short, poetic sections, some of which rely on internal rhymes and other times on end rhyme. When Josh plays basketball, the pages of the novel come to life and animate, immersing readers in the movements of basketball. Rhymes are emphasized by changes in typography: words are capitalized, indented, falling diagonally across the page. The rhythm and motion of the game is physically explored on the page. This animation occurs only when Josh plays basketball, when the language really comes alive: "He dribbles / fakes / then takes / the ROCK to the / glass, fast, and on BLAST" (10). The novel focuses on Josh and his twin brother Jordan - JB - as they have to navigate their changing relationship in junior high. The dynamics largely shift when JB starts dating Alexis, who Josh nicknames "Miss Sweet Tea." Josh finds himself alone, and after a moment of frustration on the court, suspended from the basketball team. Complicating this already difficult year of school is the emerging health condition their father is now exhibiting signs of. He's a former basketball superstar who has nurtured his sons' talents. These tensions thread through the novel, the poetic language moving them from background to forefront as it progresses. I've had a copy of The Crossover for a few years, and read in advance of picking up Alexander's latest novel Booked. The language practically vibrates off the page, and I intend to pick up the audiobook version of The Crossover next. 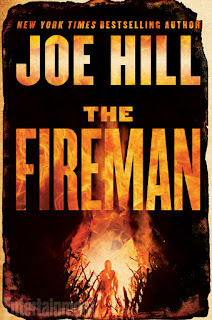 Joe Hill begins The Fireman by citing J. K. Rowling as an influence on the novel, stating that her "stories showed me how to write this one." Certainly it's not a Harry Potter novel, but I read it like one - I bought it on release day and read it almost all the way through. I've written about all of Joe Hill's books on this blog before, notably his Locke & Key comics series, and novels Heart-Shaped Box, Horns, and N0S4A2. I also recently picked up and read his short story collection 21st Century Ghosts, and the first story, "Best New Horror," ranks high as one of the most terrifying short stories I've read. I consistently look forward to his new writing. The Fireman focuses on Harper Grayson, a kind-hearted school nurse who witnesses a new disease - draco incendia trychophyton, or Dragonscale - set a man on fire on school property while she is treating a younger student. It is not an isolated incident - most of the world is going up in flames as people contract Dragonscale at higher and higher rates, and the result is always a type of internal combustion. Eventually, it is Harper's turn to contract the deadly disease while working in a hospital; even though she is zipped into a full body hazmat suit, she can't avoid it forever. When a chain reaction of combusting Dragonscale-infected patients causes the hospital to go up in flames, Harper goes home to her husband to deal with her own case of dragon scale privately, impacted utterly by the fact that she is pregnant. But Harper's husband Jakob has a disease of his own, and it has nothing to do with dragon scale. With the help of the Fireman, an elusive man who dresses in a fireman suit and has the ability to control his strain of Dragonscale, Harper gets away from her husband. Harper escapes with the Fireman to Camp Wyndham, a summer camp that is stocked with enough food for the one hundred or so adults and children who have taken refuge there to make it for a few months. Hill largely explores the effects of mob mentality in the tiny camp community, especially when that community feels increasingly threatened by everything that is happening outside of their camp. This includes the rise of cremation crews, groups of non-infected individuals who travel killing and burning those with Dragonscale. Unsurprisingly, Harper's husband has joined this crew. The Fireman is stuffed full of references to pop culture - they are constant, reminding readers about the world around them. The Fireman is also the first Joe Hill book that has felt like stylistically a Stephen King novel. Like always, I'm already looking forward to the next Hill novel, although I might return to The Fireman with the audiobook version, which, like the N0S4A2 audiobook, is narrated by the fantastic Kate Mulgrew. I first read V. E. Schwab's work after my friend, comics artist Betty Liang, recommended the first book in her fantasy trilogy, A Darker Shade of Magic. She described it as reading like YA, and it does - the characters are young, on the cusp of adulthood, ranging, I think, between nineteen and twenty-one. The series is fantastic - Schwab is currently writing the final book in the trilogy, A Conjuring of Light. I also recently picked up an ARC for her novel This Savage Song, which will be released in a little over a month from now. She's a fantastic - and prolific - author. 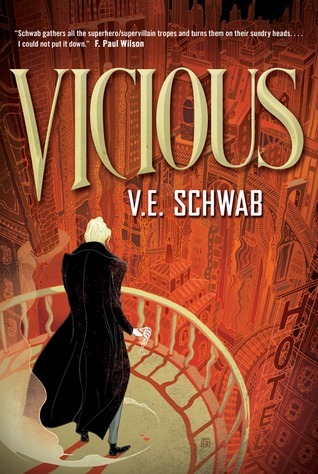 Vicious focuses on characters who are transitioning out of young adulthood into adulthood. Victor and Eli are college seniors tasked with creating a final original research project that they will be evaluated on. Both share similar interests, but Eli takes those interests a step farther. While Victor wants to focus his research on adrenaline, Eli is interested in EOs- ExtraOrdinary people - who have enhanced abilities that other people do not. Together, Victor and Eli begin a series of experiments on themselves based on the question: what if adrenaline - our fight or flight impulse - can trigger ordinary people to gain extraordinary powers? What if a near-death experience can create new abilities? (A query that is somewhat central to Ryan Reynold's new Deadpool movie.) Victor and Eli put themselves through near-death experiences in order to trigger the abilities they didn't know they had. In Victor's case, the ability to control pain levels. In Eli's, a brand of immortality. The novel flashes backwards and forwards between Eli and Victor's time in college to ten years later, when Victor escapes from prison and goes in search of Eli to exact revenge. He's joined by a young EO girl named Sydney, and his cellmate Mitch, who has abilities of his own. Throughout the novel, Victor's penchant for defacing books makes for an interesting character trait. He uses a black Sharpie to wipe out words on borrowed library books in order to create his own borrowed poetry, perhaps reflecting the purpose of books such Tom Phillip's A Humument: A Treated Victorian Novel, which creates a new text by drawing over the original text of the Victorian novel, and partially deleting words (the title A Humument comes from a partial deletion of the title of the origin work, A Human Document by W. H. Mallock). 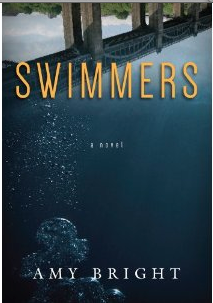 It's a compelling novel, very Neil Gaiman-esque at times, especially in the opening scenes. I like the way that Schwab works with characters straddling their teens and twenties, a kind of new adult category. I'm looking forward to reading The Savage Song next, which she writes as Victoria Schwab, rather than V. E. Schwab. 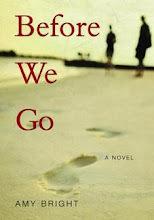 Between The Royal We - a fictionalized version of Prince William and Kate Middleton's love story - and Eligible - a modern day retelling of Pride and Prejudice - the books I have been reading lately largely rely on some form of source material. 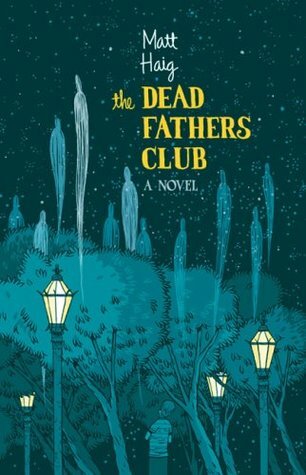 The same can be said of Matt Haig's The Dead Fathers Club, which draws heavily on Hamlet. Philip Noble's father has recently died in a car accident, although his family can't comprehend how he crashed into a bridge in the middle of the day. Philip's father, however, sets the record straight when he comes back as a ghost and tells his son that his brother - Philip's uncle - tampered with the brakes, causing the accident. His father entreaties Philip to kill his Uncle Alan and avenge his death in a timely fashion. Otherwise, Philip's father is going to be taken over by the Terrors, a horrifying prospect. For eleven-year-old Philip, this is a lot to take in. Uncle Alan moves in on his brother's abdicated territory with a disturbing speed, moving into the house, bribing Philip with a PlayStation, and proposing to his mom in a very short time frame. Philip's panic and sense of responsibility to his father is heightened by his childish and frank narration, which, in part, is conveyed through stream-of-consciousness and a sense of dissociation. It also very much reflects its time of publication, especially evident in the pop culture that Philip has to draw on. For example, when the ghost of his dad tries to convince Philip to steal a van and drive home from his overnight school field trip: "Dads Ghost looked at me with the most serious face I had ever seen like Norman Osborn in the first Spiderman when he has the nerve gas before he becomes the Green Goblin and he said By his phone were some keys." This narration has been compared in other reviews to that of protagonist Christopher in Mark Haddon's The Curious Incident of the Dog in the Night-time. The more modern the retelling of a canonical or classical story is, the more likely it is to replace the previous version that I've read. 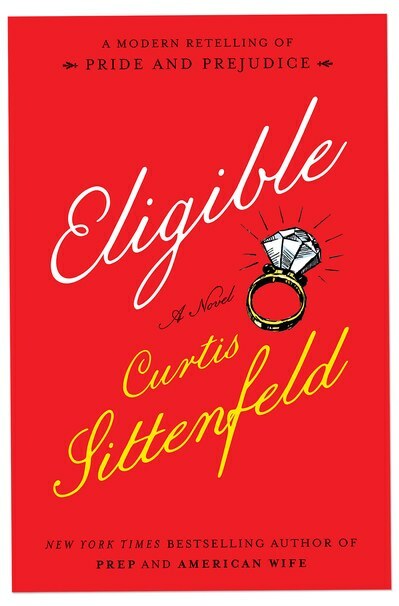 For example, I remember that when I read Curtis Sittenfeld's Eligible, I compared her version of the characters not to those written by Jane Austen, but instead as they appear in the Bollywood-style movie adaptation of the novel in Bride and Prejudice. Now, Sittenfeld's twenty-first century version - complete with a reality show ending - has usurped that version. Similarly, Haig's version is now much more relevant and memorable, and Uncle Alan is much more recognizable than the type introduced by Hamlet's uncle Claudius. I enjoyed Haig's novel immensely, especially the style he uses to craft Philip's distinct voice. Curtis Sittenfeld is the author of Prep, the 2005 novel that largely appealed to both teenage and adult readers. I loved Prep, one of the first boarding school books I'd read that actually covered the four years from freshman to senior year in one book. Others, like Jon van de Ruit's Spud, E. Lockhart's The Disreputable History of Frankie Landau Banks, Robyn Schneider's Extraordinary Means, and Stephenie Perkins's Isla and the Happily Ever After take place over just one year of boarding school rather than all four. Sittenfeld's Eligible is a much different book from Prep, and is, as the cover suggests, "a modern retelling of Pride and Prejudice" and presents a twenty-first century version of the Bennet family, one that circles around cross fit and yoga, social media and reality TV. Liz Bennet is a magazine writer in her late thirties living in New York and she has just returned home after her father's surgery to help her family with his care. Her older sister Jane, a yoga instructor, goes home with Liz to Cincinnati, a city much slower and quieter than the New York that they've called home for the last few years. The dwindling family inheritance previously supported their interests: "Jane and Liz had always held jobs, but even for them, a certain awareness of the safety net below had allowed the prioritizing of their personal interests over remuneration" (11). Meanwhile, middle sister Mary is taking her third Masters degree online, while younger sisters Lydia and Kitty have joined the cross fit culture. In this version of the classic story, Chip Bingley and Fitzwilliam Darcy are doctors - Darcy is a neurosurgeon. Bingley is fresh off of a stint on Eligible, a Bachelor-like reality show on which he did not find love, and he is no less eligible than he was when he was on the show. Eligible is an incredibly humorous novel, and thoroughly re-invents the source material for a twenty-first century context.